A donut store creates a record pay-it-forward movement. Marketers take note! The holidays has the ability to bring out the good will in most of us. Countless Brands play into the holiday spirit. I have written about some of the better examples of this last holiday season (see here). 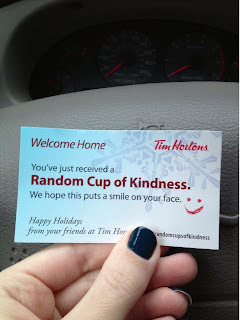 A donut brand from Canada called Tim Horton’s has been running a program called “Random Acts Of Kindness” where they randomly offer a free cup of coffee to their patrons with the hope that these patrons will pay it forward throughout their day in any which way they can: holding open a door, letting your employees out early, etc. While the event and promotion that prompted it is wonderful, it is too bad that it is more often than not solely aligned with the holiday season. Such an activity should be done throughout the year because it not only is good for a Brand, it is good for the community in which the Brand operates. Retail has a huge opportunity, and perhaps even responsibility, to spark good will in the places that it does business. This example of the effects of an act of kindness is similar to many other cases, and thus demonstrates that most people are hungry to do good. Why? It makes them feel good about themselves and it offsets the many other bad things that they hear about everyday. Brands can be facilitators for the unlocked desire to do good. Just imagine the love that people will have for a Brand that does this. All we need to do is think of examples like Toms Shoes to illustrate the potential power of a strong social responsibility vision and plan. While socially considered work is growing in popularity (see here), simple social actions like the one done by Tim Horton’s should be more frequently explored. It doesn’t require that much marketing material, and social can do a lion’s share of the awareness benefits of the program. The biggest cost is in the product or service being used to trigger a pay-it-forward behavior. Remember the Christmas Gift surprise stunt done by Spanair?! (see it here). It will be interesting to see whether we see more of this in the coming years.